A classic design reinvented, simplicity and style combined are the hallmarks of the DHP Modern Canopy Metal Bed. Its sleek square lines finished in a rich, gun metal gray has a timeless look perfect for any setting. Featuring 22 metal slats to provide support and comfort, this bed does not require a box spring or additional foundation. Pair the canopy bed with curtains for a romantic, personal touch. 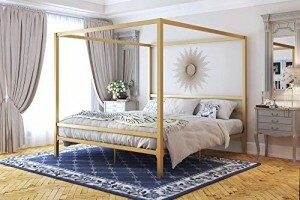 Whatever your style, the DHP Modern Canopy Metal Bed is magical in every way! King bed dimensions: 84″L x 78.5″W x 73.5″H. Weight limit: 500 lb. Ships in one box. Shipping dimensions: 85″L x 16″W x 5″H. Product weight: 113 lb. Shipping weight: 121 lb. Modern and sleek! Great buy!